Healthy heart: Omega-3 vs. Statins. Nature wins! Omega-3 fatty acids play a crucial role in brain function as well as normal growth and development and contribute to a normal heart function*. Your body cannot produce them, hence the necessity to obtain omega-3 through food. So how does Omega-3 supplementation compare with statins when it comes to preventing cardiac issues? Comparing the two major reviews done for each - for Omega-3 seems to suggest the natural way is more effective. The Omega-3 review in total was pooling 14 trials over 71,000 people while the Statins review looked at 17 trials involving 57,000 people. A recent review in the Journal of Clinical Lipidology looked at all major studies testing the effects of supplementing Omega-3 fish oils. Fourteen randomised-controlled trials involving over 71 thousand people, were pooled, out of which there had been 1,746 cardiac deaths. At first sight, Omega-3 supplementation was associated with an 8% reduction in cardiac death. Good but not great. However, larger effects were present with higher dosages and in higher risk subgroups. Those taking 1 gram or more of omega-3 (combined EPA + DHA) had up to 29% lower risk. For those with cardiovascular risk factors (raised triglycerides or LDL cholesterol) the risk reduction was 17%. You can read the full review here. So how does this compare to the benefit you would expect with statins? The European Heart Journal published results of a major European study in 2015. The results of 17 trials where pooled, involving over 57 thousand people in which there had been 433 cardiac deaths. There were 213 deaths in people on statins and 220 in those not taking statins. This risk reduction was only 3%. You can read the full summary here. Choosing the right supplement can be challenging, and Omega-3 products are more difficult than some others, in terms of determining purity, quality, sustainability of sourcing, to name a few. Read our separate blog on choosing the right Omega product for you here. 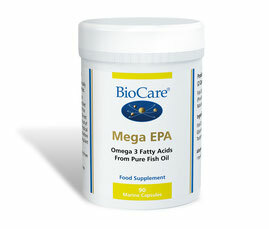 More information about BioCare Mega EPA as well as other omega fatty acid solutions can be found here: https://www.nourishme.ch/shop/omega-fettsäuren. 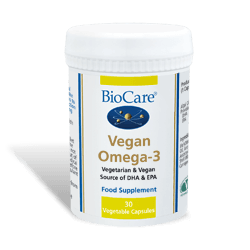 Vegan Omega-3 is one of the first supplements to give vegetarians and vegans a direct supply of important EPA & DHA from natural algae. More information about BioCare Vegan Omega-3 as well as other omega fatty acid solutions can be found here: https://www.nourishme.ch/shop/omega-fettsäuren.